The National Motorcycle Museum had a particularly busy fortnight at this year’s Classic TT Festival with our taking part in various high profile activities both on and off the track. We really did take the museum to the people with no less than 32 Norton’s from every era being transported from the collection over to the island for our huge “pop up” museum display. From 1906 through to the 1990s, a Norton race machine from every decade of the last century was displayed in what many visitors described as “the best display ever seen in a TT paddock”. One of the biggest highlights for many was the “Norton – The Rotary Years” – Parade. Whilst individual Norton rotary race bikes have appeared in parade laps around the Mountain Course – and, of course featured in race wins and podiums – never before had so many appeared at one time on the island. A sunny Saturday on 29/08/15 saw no less than 12 of the revolutionary machines, all owned by the National Motorcycle Museum, take to the 37.73-mile course. A whole host of famous names had the honour of taking part including some of the bike’s original riders including Trevor Nation, Steve Cull & Ian Simpson. 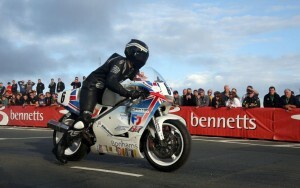 Other riders included William and Michael Dunlop, Michael Rutter and Jamie Whitham. “The White Charger” that the late Steve Hislop famously rode to victory in the 1992 Senior was ridden by 23-time TT Race winner John McGuinness resplendent in replica Hislop leathers & helmet! Sunday 30/08/15 saw many of the museum’s ex-works rotary Norton’s appear once again on the short circuit at the Festival of Jurby with the likes of McGuinness, Rutter & Cull onboard. 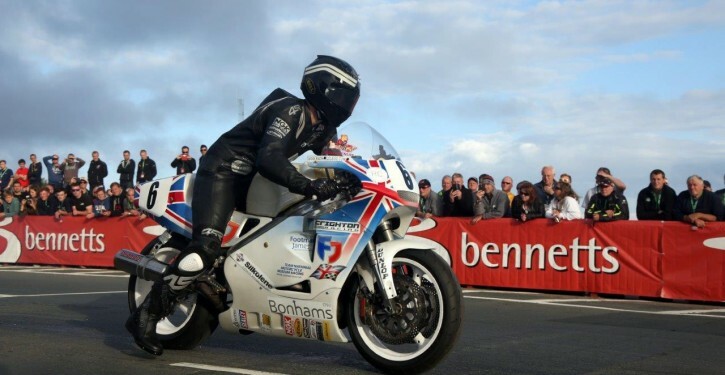 Team National Motorcycle Museum Racing had a challenging week culminating on Monday 31/08/15 with team rider William Dunlop posting a DNF in the F1 race on the team’s rotary Norton race machine. Museum Director James Hewing commented: “Team National Motorcycle Museum Racing’s entry to run a Norton rotary race machine in the F1 event was a huge challenge and we are obviously disappointed not to have finished. William Dunlop and the whole team worked tirelessly all week with William declaring the bike ‘wicked fast’. Everyone knows that there is no tougher place to go racing and feedback from race fans has been really positive”. The Museum film crew has created four short films from the event which include the paddock “pop up” museum, the rotary parade, the festival of Jurby and Team National Motorcycle Museum Racing. All these films will be available to view from early October on the museum’s new website www.thenmm.co.uk.